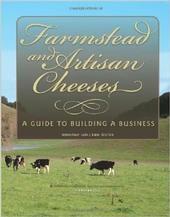 The UC ANR publication 'Farmstead and Artisan Cheeses' helps new cheesemakers start up their businesses. Thanks to the happy cows of the California Milk Advisory Board, many know that California leads the nation in milk production. While you may think of Vermont or Wisconsin when you think of cheese, specialty cheeses make up about 11 percent of California's cheese production, creating a growing niche market. Today artisan cheesemaking is a $119-million dollar industry in Marin and Sonoma, and the two counties are home to the second-largest concentration of artisan and farmstead cheesemakers in the country. The trend in farmstead and artisan cheesemaking shows no sign of slowing — membership in the California Artisan Cheesemakers' Guild increased 15 percent in 2014.